Beleaguered passengers are set for more misery as rail workers plot a fresh round of strikes next month in the long-running dispute over guards on trains. 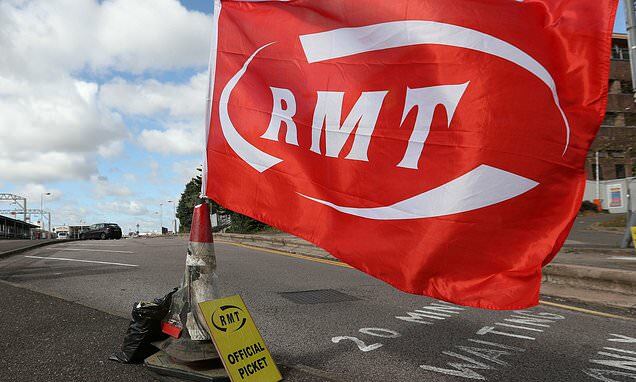 Members of the Rail, Maritime and Transport union (RMT) on Arriva Rail North are already striking on Saturday and on January 26. The union announced that further stoppages will be held on the first three Saturdays of February - leaving furious passengers to bear the brunt of the action again. RMT general secretary Mick Cash said: 'RMT continues to make every effort to get serious and meaningful talks going with Northern but the company are not interested and would prefer to fire off a barrage of misinformation about both the dispute and their intentions to deflect attention from the impact of their behaviour on the travelling public. 'German-owned Northern Rail have made it perfectly clear in emails to staff that they want to run trains without a safety critical guard on board in a move that would wreck both safety and access to services and they should listen to their front-line staff and pull back from that plan immediately.